If you’re looking for the BEST Fudgy Chocolate Brownies Ever, then you’ve come to the right place! 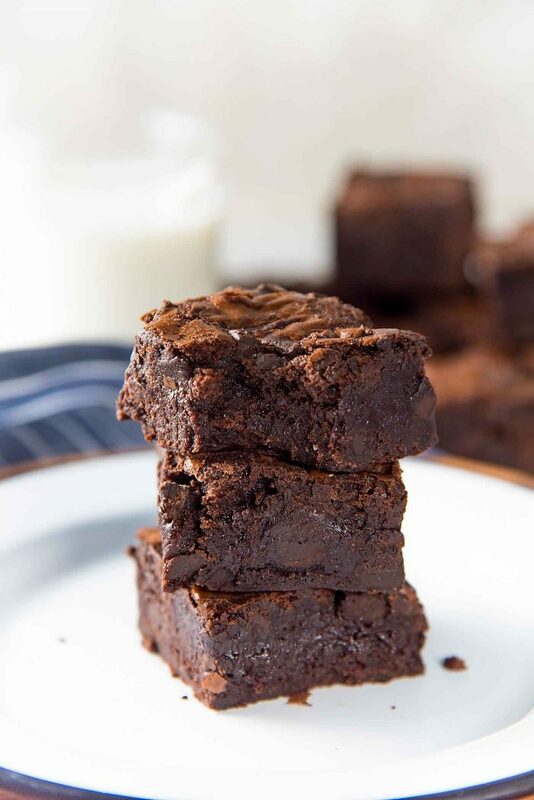 🙂 This tried and true recipe uses cocoa powder (instead of melted chocolate) to make double fudge cocoa brownies that are slightly chewy and fudgy at the edges of the pan, while the middle pieces are super fudgy. These fudgy cocoa brownies have just the right amount of sweetness with deep, bittersweet chocolate flavor. I’ve also included plenty of tips in this post to help you make the BEST fudgy chocolate brownies! These fudgy chocolate brownies are a hit no matter who or what occasion I bake them for. But it did take me a few tries to get it right. I usually make brownies with melted chocolate (which is great, obviously), but I wanted brownies that were even fudgier with MORE chocolate (which is never a bad thing in my book). So I started experimenting with cocoa brownies, and after numerous attempts, I’ve perfected the recipe for these addictive fudgy chocolate brownies (or as I’d like to call them Double Fudge Cocoa Brownies). These fudgy chocolate brownies (cocoa brownies) have been tested over and over again, so I can confidently say that this recipe is foolproof! 🙂 And they don’t mess around in terms of flavor either. They are double chocolate cocoa brownies (or double fudge cocoa brownies), with deep chocolate flavor. You can also easily adjust the fudginess to your liking by adjusting the amount of baking time as follows. 30 minutes for extra gooey, fudgy pieces in the middle, and perfectly fudgy pieces at the edges of the pan. 35 minutes for perfectly fudgy pieces in the middle, and chewy-fudgy edges. 40 minutes for chewy-fudgy pieces in the middle, and chewy edges. 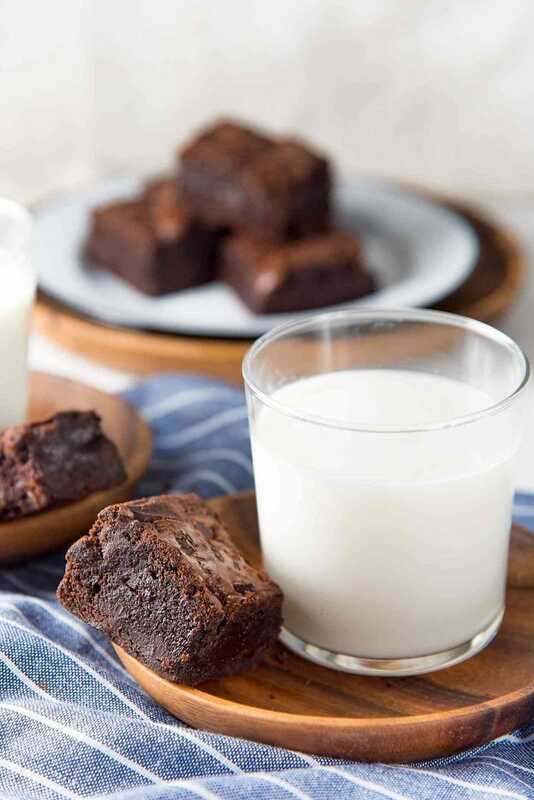 It helps to understand what each ingredient contributes to your chocolate brownie recipe, so that you can learn how to make the perfect fudgy chocolate brownie with cocoa powder! The melted chocolate adds the fudginess to chocolate brownies. Or more specifically, it’s the cocoa butter and sugar in the chocolate that make chocolate brownies fudgy. However, since cocoa butter remains a solid at room temperature, the chocolate brownies tend to be a bit firm as well. So instead of melted chocolate, these are fudgy brownies made with cocoa powder. The cocoa powder also adds a deeper chocolate flavor to these brownies. Another advantage of making cocoa brownies is that here you remove all the cocoa butter and replace it with regular butter instead. And since regular butter is soft at room temp., this makes the brownies extra fudgy. It’s important to use melted butter for this recipe. Unmelted butter will make the brownies more cake-like than fudgy. But by removing melted chocolate, you’re also removing a certain amount of sweetness (sugar) as well. So you must add extra sugar to compensate for that in this fudgy chocolate brownie recipe. What does the sugar do in a cocoa brownie recipe? And which sugar is better? White sugar or brown sugar? The obvious purpose is to add sweetness. Cocoa powder is bitter, and the extra sugar will provide balance and make the chocolate brownie sweeter (instead of bitter, which obviously isn’t as desirable). Sugar makes the brownies “softer”. This is because sugar acts as a tenderizer for baked recipes. For example, with regular vanilla cakes, recipes with extra sugar tend to have a softer crumb. For this brownie recipe though, we are not really worried about getting “softer” brownies, as it doesn’t really provide an advantage as such. White sugar makes the chocolate brownies chewier. Since white sugar is “dry” (with no molasses) it melts to create a chewier brownie. Brown sugar makes the brownies fudgy. The molasses in brown sugar melts to create a “wetter” batter that becomes fudgier when baked. So with all this in mind, I decided that it was important to include both kinds of sugar in this cocoa brownie recipe. You can use ALL white sugar if you do want a chewier brownie, and use ALL brown sugar for a fudgier brownie recipe. However, be mindful of the baking times when you make those adjustments, as you could end up with slightly different results then. Eggs play a big role in chocolate brownies as well. A brownie isn’t really a brownie without a nice, crackly top, amiright? Eggs + sugar is how you achieve that deliciously crackly brownie surface! How do you get that nice, crackly brownie surface? The eggs and sugar are beaten together until you have a pale, thick mix. 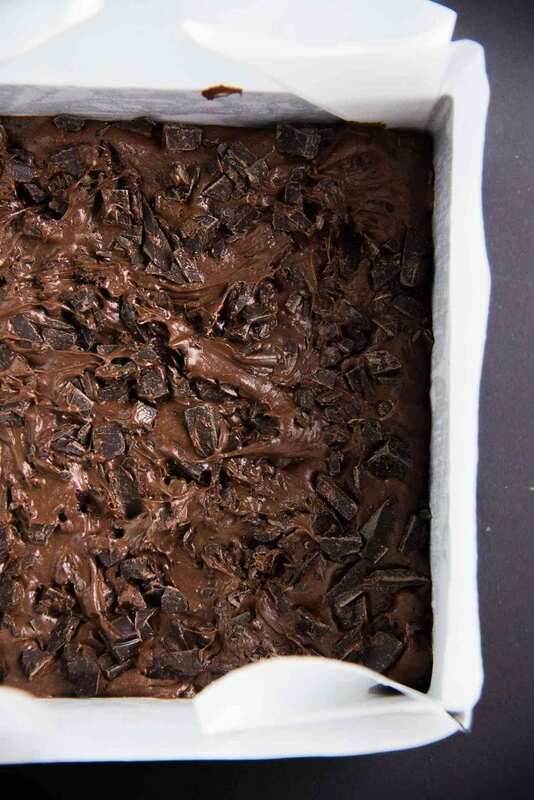 This stage is crucial to create that beautiful brownie crust. The eggs are whisked with sugar to incorporate air which creates an almost meringue-like mix and THAT is what creates that crackly brownie crust we all love! This also brings us to another reason why eggs are important in this fudgy chocolate brownie recipe. Egg whites help create the meringue-like crust, while the yolks help make the chocolate brownies fudgy. The eggs whisked until pale and thickened. This step helps create that crackly brownie surface that we all love. Since I wanted extra fudgy brownies, I used 3 whole eggs plus 1 egg yolk. When I make these cocoa brownies using ONLY whole eggs, the edges of the brownies become more cake-like than fudgy. And if I removed 2 whole eggs and used 2 extra egg yolks, the brownies were fudgy, but the batter was too dry. So 3 whole eggs plus 1 egg yolk is the sweet spot. To make these cocoa brownies EXTRA fudgy, I added chopped dark chocolate to the batter as well! 🙂 You can substitute this (or add in addition to it) with chopped nuts, or other types of chocolate like white chocolate or milk chocolate, or even fruits like raspberries and strawberries, or even crushed Oreos! Use melted, very warm butter. The butter melts both types of sugar during mixing which helps create that fudgy and chewy texture, and the meringue-like, crackly surface. Use both types of sugar for best results. 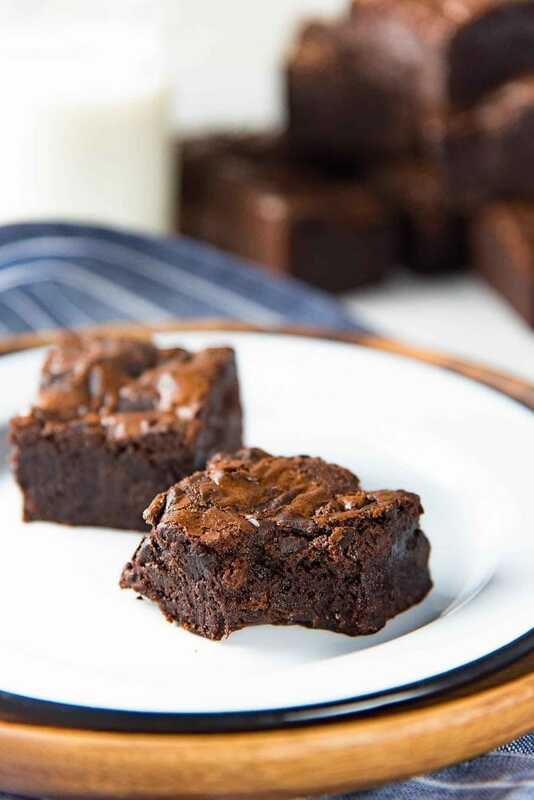 That way you get the best of both worlds – chewy and fudgy brownies! Mix the butter, sugar and eggs together for 2 minutes. So that you have a pale, thick mix. NEVER over-mix the flour and cocoa powder. You want to avoid using a hand-held mixer to fold in the dry ingredients. Whether you use a hand-held beater or spatula, you should mix the flour and cocoa powder ONLY until they are just mixed through. This way you avoid the gluten from developing, and end up with a deliciously fudgy brownie. Over-mixed brownie batter on the other hand, results in cakey brownies. 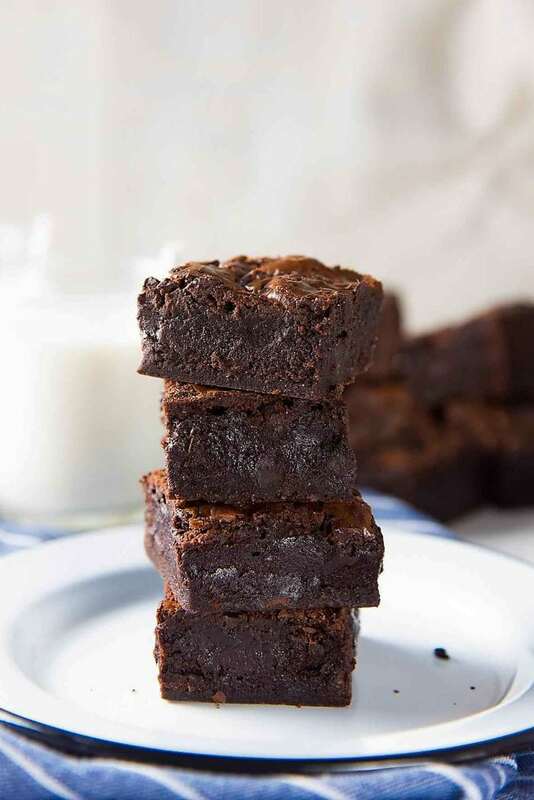 These fudgy chocolate brownies are so decadent and rich in flavor with perfectly sweet, deep, bittersweet chocolate flavor. And they also keep really well in the fridge (in an air-tight container), so you make a batch of it and store in the fridge for a special occasion or whenever you fancy some fudgy, chocolatey deliciousness in your life! 🙂 These will be PERFECT for Valentine’s day as well. 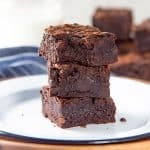 The Best Fudgy Chocolate Brownies - these fudgy brownies are made with cocoa powder with chunks of real chocolate in the brownies. Included in the accompanying post are detailed tips on how to make perfect fudgy cocoa brownies. There is inactive time in the recipe, so please read the full recipe first before proceeding. Preheat oven to 350°F. Line an 8 x 8 inch square pan with parchment paper. To make it easier to remove the brownies later, have an overhang of parchment paper over the edges of the baking pan. Set aside when done. Place the butter in a heat-proof bowl and microwave to completely melt the butter. Add the brown sugar, white sugar and salt while the butter is still warm. Mix to combine the butter and sugars together until you have a smooth paste. Add the vanilla, coffee extract (if using), eggs and egg yolks to the butter-sugar mix. Whisk in the eggs until they have been incorporated into the butter sugar mix. Using a hand mixer, whisk the butter-sugar-egg mix on medium speed, until the batter becomes pale in color (about 2 minutes). Add the flour-cocoa mix into the wet ingredients (in two batches if that's easier) and mix it in until just combined. DO NOT OVER-MIX. Add about ⅔ of the chopped chocolate halfway through the mixing in of the flour. The goal is to make sure the batter is not over-mixed when the flour is being incorporated. Scrape the batter into the prepared pan. Spread the batter evenly. Sprinkle the rest of the chocolate on top. Bake for 30 - 40 minutes (30 minutes = extra fudgy, 35 minutes = perfectly fudgy for my liking, 40 minutes = less fudgy). Remove from the oven and let it cool down to room temperature. Remove the brownies from the pan and let them chill in the fridge for a couple of hours (chilled brownies are easier to cut). Cut the brownies into 16 pieces. Use a warm knife to cut, making sure to clean the blade after each cut for clean, neat edges. If you liked this fudgy chocolate brownie (double fudge cocoa brownie) recipe, don’t forget to subscribe for new (and free) recipes by entering your email address on the side bar (and get all these recipes delivered straight to your inbox), so you don’t miss out on a thing. You can find me on FACEBOOK, TWITTER,INSTAGRAM, PINTEREST, YOU TUBE and GOOGLE-PLUS too. Making these brownies were so easy and they smell AMAZING! Just one question, should I keep the temperature the same for a fan oven? Yay!! 😀 I hope you enjoy eating them too! They taste absolutely amazing too! I love them, thank you for sharing and for replying so quickly! Thank you for sharing this recipe! Its brilliant! Never fails. My 4 year old daughter and I have made it 3 times in multiple batches. It tasted divine! I also sold 4 trays for a bake sale in a hospital for charity. All of the brownies were gone in no time!. Thank you so much. You have gone in a lot of detail explaining the steps. Its really helpful! Yaay, thanks so much for letting me know Eliza! 🙂 So glad you liked it, and the information was helpful! Can walnuts or pecans be added to your recipe or will it alter the texture? Sorry! I didn’t see your reply earlier. I will definitely try this recipe! Thank you! Can I add walnuts or pecans to your recipe? could you give me a rough guess at how long these will keep for in the fridge? I see you say they store well in air right containers but how long roughly do you think? Many thanks for such an awesome recipe! I don’t like keeping brownies in the fridge because it makes the brownies go stale faster. I keep them at room temperature for about 3 – 4 days, and if I want to keep them longer, then I keep them in the freezer. I have to allow the brownies thaw overnight if I do this, but the brownies stay fresh for longer in the freezer. Hope that helps! Thank you so much for this recipe! I made them last night and they came out beautifully. I sampled a bit while the brownies were still warm and the texture was a little cakier than I was expecting, but I’m guessing that that’s because I wasn’t able to add as many chocolate chunks as the recipe called for. The texture did become quite a bit fudgier after I allowed the brownies to cool completely, anyway. Also, for any gluten-free lurkers out there, this recipe works super well with gluten free flour! I just used three ounces of Arrowhead Mills gluten-free all purpose flour, and it worked perfectly. Absolutely amazing recipe, the Brownies turned out fabulous. I ran out of Cocoa Powder and added Ovaltine to make up the difference. The Brownie was still gooey and yummy! This brownie forms the bottom most tier of my chocolate sensation birthday cake for myself! Thanks for the detailed recipe and all the other little pointers! Thanks a lot, you have one of the best-written instructions I’ve found, and have highlighted how important it is to whip the eggs well. I haven’t used coconut oil to make these brownies before, so I’m not sure how they will turn out. Generally though, I use vegetable oil to replace butter in my cakes, if I want a lighter crumb, and opt for butter for a denser cake. 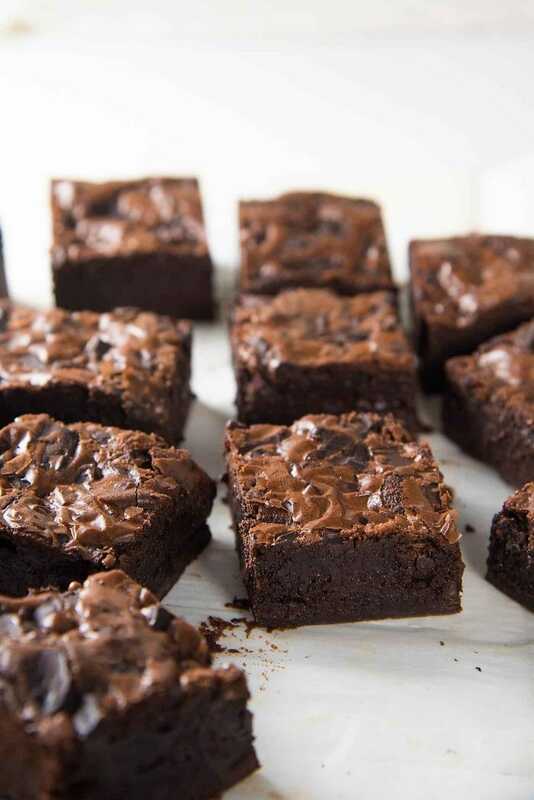 There is a possibility that the coconut oil may make the brownies lighter since these brownies are made with cocoa powder instead of melted chocolate, but I can’t be sure since I haven’t tried it myself. As for honey vs maple syrup, you can choose whichever flavor you prefer in your brownies. Again, I haven’t substituted a liquid sweetener for granulated sugar for this recipe so I don’t know how it will impact the final results. As a rule of thumb, you do need to reduce the amount of honey you use relative to the sugar, so I would start at about 10 oz of honey instead of 12 oz. I’m sorry I couldn’t be more helpful! I have used both light brown and dark brown sugar (soft) for these brownies, and I like both. I personally prefer dark brown sugar. It’s more about personal preference as any type of soft brown sugar should work in this recipe. However, I don’t particularly like using dark muscavado sugar because it has a stronger molassey flavor (but light muscavado sugar should be fine too!). Can I ask if it’s 3 egg whites and then one egg yolk or 3 egg (all) and an extra yolk? It’s 3 whole eggs + one egg yolk. I put them all in at the same time. But I make sure I beat the mixture well until it’s pale in color 🙂 Hope that helps! Hi, I wanted to know if you use unsalted or salted butter? Hi Stephanie, I use unsalted butter for this recipe. If you do use salted butter instead, you will need to adjust the amount of salt you add to the recipe. Hope that helps! My first ever comment on a page like this. Its well deserved. What a perfect recipe. My step daughter and myself enjoy following this recipe step by step after also reading all the tips. They have not long come out of the oven perfectly and we have all just finished them with some ice-cream. I’m sorry the recipe didn’t work for you. It’s the first time I’ve heard of this recipe not working. The top of the brownies are not meant to be crispy though. They have a shiny crust, but it’s not a crispy crust. As for the fudginess, if you can send me a picture of the brownies, via facebook or email I can hopefully figure out what might have gone wrong. Hello… Can i make the brownies without the chocolate? Does it affect? You can leave out the chocolate if you like, but it will be less fudgy. The melted chocolate chunks in the middle give the brownies more fudginess. Hope that helps! I did last night. Just doubled the cocoa. Used dark Hershey’s cocoa. I’m stopping tonight to get the chocolate chunks and make again. This recipe is spectacular. I was craving the Thunder from Down Under that Outback serves, but too cold to stop and wait around after work. Went home and baked these with items on hand. My new favorite recipe!!! Hi, Do you have measurements in grams or cups? I can’t find all the conversions in your link. Thanks!!! I’ve added gram measurements to the recipe. There’s a toggle button in the recipe card to switch between oz and gram measurements now. I hope that helps, let me know if you have any other questions! This recipe sounds amazing! You mention that the chocolate chunks can be substituted with fruit or nuts. In your experience, did the omission of that extra chocolate for nuts affect the moistness of the brownie/ crisp crust? It will be slightly less fudgy without the chocolate chunks, because there won’t be melted chocolate pieces in the middle, but it’ll still be fudgy enough with nuts or dried fruits. The crust on top doesn’t change with the addition (or not) of chocolate or nuts or fruits, since it’s the egg and sugar mix that create the crust. I’m not usually a commenter but I have to give you some utterly deserved feedback on this recipe. I have always struggled with making brownies for some reason, they never come out as I like but this recipe really delivered. I live at altitude and even with this against me they were delicious, exactly as you described, fudgey, chocolate heaven. My friends were impressed. I was impressed. I will make them again. What I particularly liked was you reasoning behind the different methods and elements that go into the brownie. The explanation and rationale helps you understand the need for the ingredients to be blended and cooked in that specific way. Well done and thank you. What size of egg are you using in the recipe? Since everything is so balanced I think it would make a difference? I use large eggs with all my baking which is a good standard size for eggs. Hi..I made these brownies, taste so delicious. But why no shiny crust surface. I had follow all the instruction from the recipe. Can you help me? I’m not sure why that would have happened, as this recipe always gets the shiny crust. It’s a darker color than some brownies, but it’s still always there. 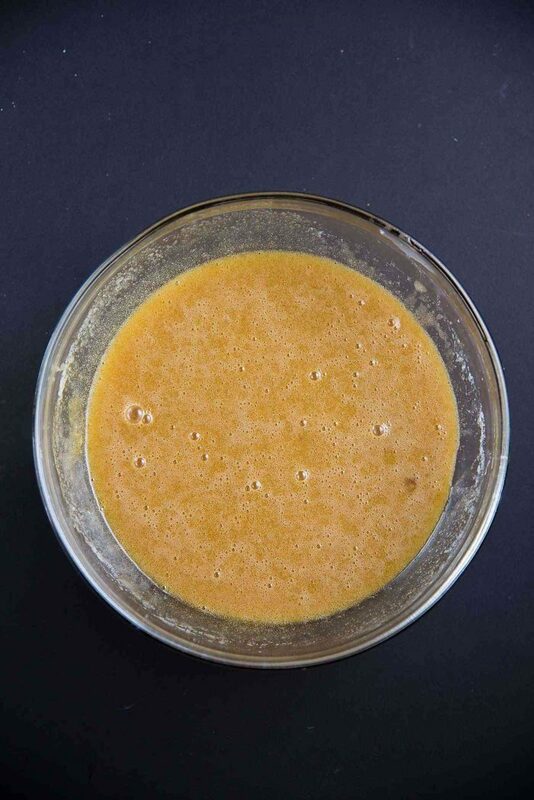 What I would recommend is to whisk the batter a little longer after adding the eggs. 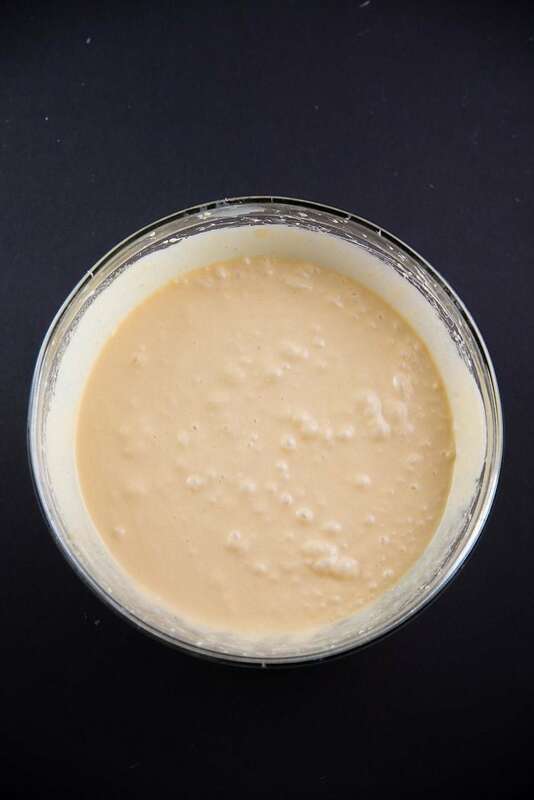 Make sure the batter looks a lighter color after mixing it. It’s that foamy light color of the eggs that indicate that there will be a shiny surface. Maybe mixing it for an extra minute or two might help. Do you think you could replace the butter with blood orange olive oil? If so, the same amount? Less? Thank you for the question. I haven’t made these brownies with olive oil before, so it’s hard for me to recommend exactly how much to use. 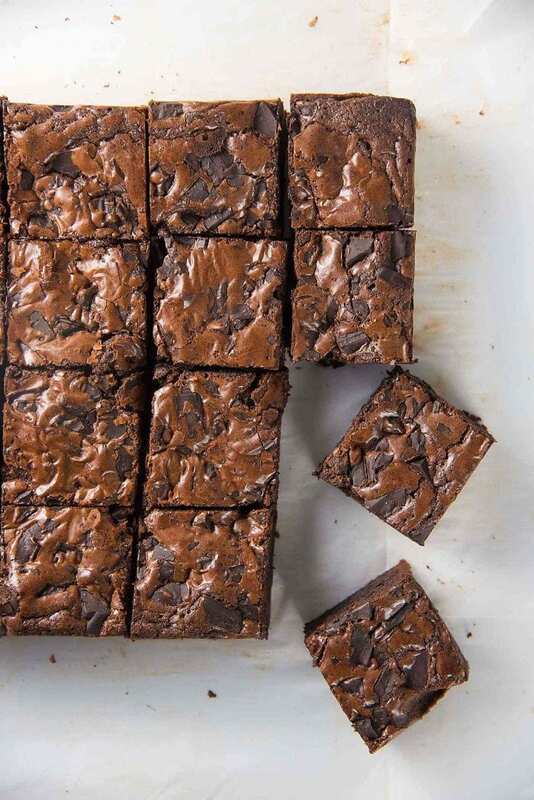 But no matter how much olive oil you use, the texture of these brownies will definitely change. The butter contributes to the rich, fudgy texture here. Plus, I’ve tasted blood orange olive oil before too, and the blood orange flavor is too subtle to be paired with the rich chocolate flavor in these brownies, so it’ll get lost here. I’m sorry I couldn’t be of more help. I made these last night cooled in the fridge followed the recipe down to a T. Went to cut this morning and it’s like a big heavy rock square. I’m hoping it softens a bit in microwave before I serve. That’s quite natural actually. If you store brownies in the fridge overnight, you will need to let them thaw to room temperature before eating. Brownies always harden in the fridge. In the recipe, I suggest cooling them in the fridge only until they are just chilled enough to cut through (about 2 hours). However, DO NOT microwave the brownies! If they are heated too much, they’ll become too hot and liquid in the center because of the melted butter and chocolate chunks. Brownies keep very well for a few days at room temperature (in an air-tight container), however if you want to store them for longer, they can be kept in the fridge or freezer (which is better), but MUST be given enough time to come back up to room temp. before eating. I hope that helps! I made these a couple of days ago and they are simply amazing, so fudgy and delicious. Best brownie recipe by far. Thank you so much Nicola! They really are fudgy, just the way I like ’em. 🙂 I’m really glad you enjoyed the recipe. Made these tonight! Oh my goodness…..utter heaven! These brownies are the best I have ever made! They are everything you said they would be! 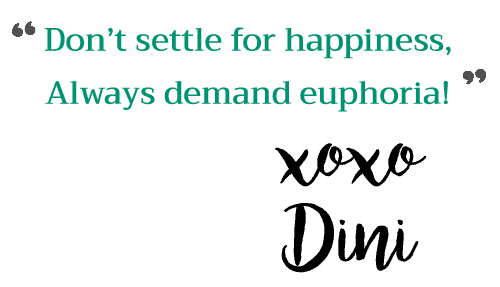 Thank you Dini! I’ll be sure to check out some other recipes too. 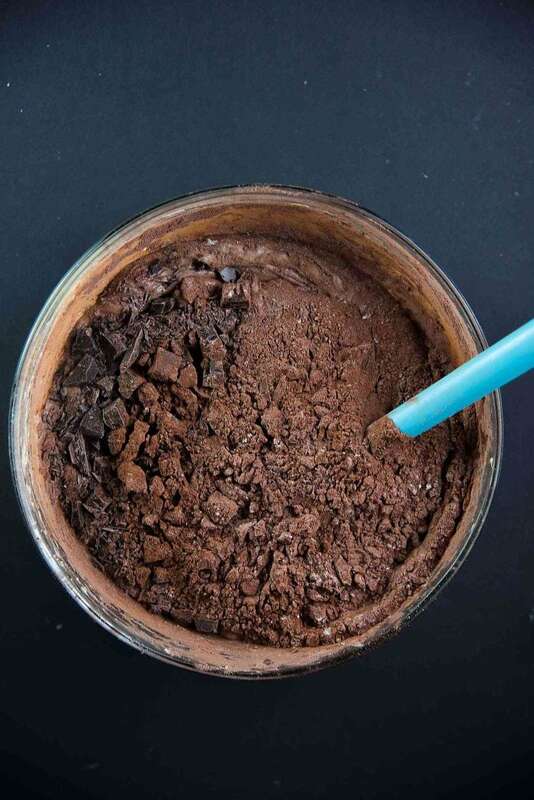 You can use either of the cocoa powders for this recipe. I use Callebaut cocoa powder (dutch processed) which is darker than store bought cocoa powder. Since this recipe doesn’t call for any baking powder or soda, the type of cocoa powder you use will not have an effect on the final product. Hope that helps! Hi! Thank you so much for sharing the recipe, I will try them in a few days! Just really curious, would we need baking powder for these? Thanks! Got that, thank you for such an informative post! I’ll be sure to let you know how great the brownies turn out when I make them in two days! I made these brownies for my niece’s bridal shower. I made the mistake of assuming that 6 oz of sugar equaled 3/4 cup etc. etc. I saw your link for weight conversions, but it wasn’t until after I had already put them in the oven. I just prayed that since I consistently did it that way with every dry ingredient that they would turn out okay. Well, they turned out more than okay!! People started eating them the minute they saw them. I was worried that by the time we got to dessert, there wouldn’t be any left. Not a crumb was left in the pan by the time the shower was done. I received many raving comments about the brownies. (I made them into Creme de Menthe brownies). I’ll use this recipe again for sure! Thanks! I loved this recipe – definitely the best brownies I’ve ever made! I’d also like to thank you for using ounces, I’m British and so many recipes online use cups, which make very little sense to those outside the US! OMGI made these this morning and took them to work not knowing what they’d taste like;! I thought my colleagues were going to fight over the last piece these definitely are the best brownies on the planet! When you say 6 oz of sugar, I assume you mean 3/4 cup…not by weight. Thanks!! 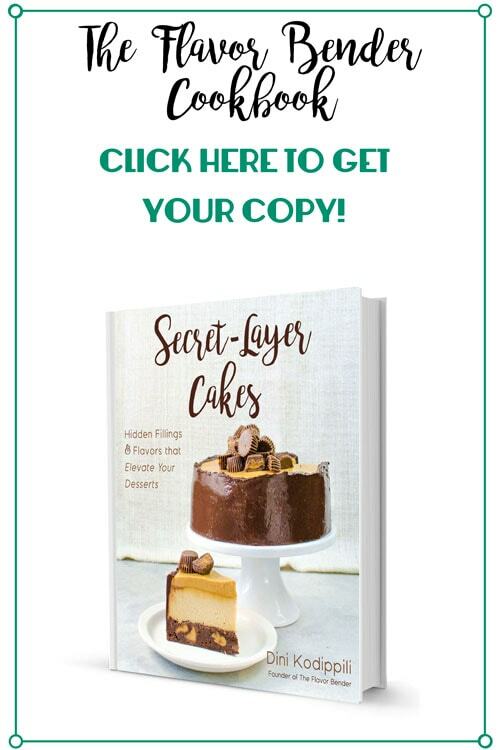 Weight measurements are more accurate than volume measurements, and give the most consistent results when it comes to baking. That’s why all dry measurements are in oz or grams. However, if you do want to convert it to cups, I have a measurement conversion guide here – https://www.theflavorbender.com/measurement-conversions/ that details the weights of 1 cup measures of commonly used ingredients. For brown sugar – 1/2 cup = 3 oz – 4 oz (depending on how tightly or loosely you pack the sugar). OMG I just made these brownies for my family and for lunch at school, and boy, all I can say is you have to make these. I have been trying to look for the perfect brownies (Cause I love em) and these are the ones. Fudgiest, Tastiest brownies I have ever tasted. YAAY!! Thank you so much for making my day Jassy Bassy! I am so glad that you loved these brownies 🙂 They are my absolute favorite too! 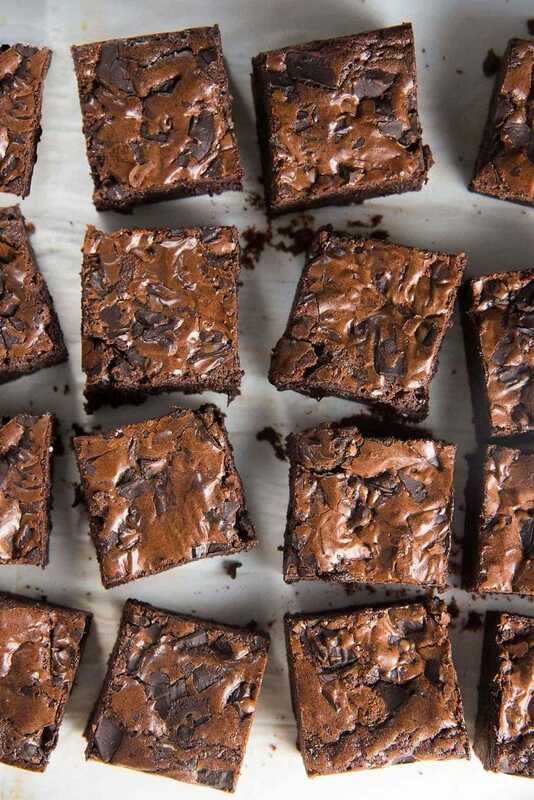 Loving all your brownie tips and tricks for making them extra rich and fudge-y — so amazing! Great recipe! omg these really do look like the BEST ever. Look at that fudginess!! The perfect weekend treat that I need in my life right now!